Following the success of its vending machine ramen, foodstuff producer UMAI has added two flavors of udon to its canned noodle selection -- kitsune udon (udon with fried tofu) and curry udon. The canned noodles have begun to appear in vending machines and convenience stores nationwide. Like UMAI's ramen, the thick udon noodles are made from konnyaku, so they don't turn soggy before you eat them. 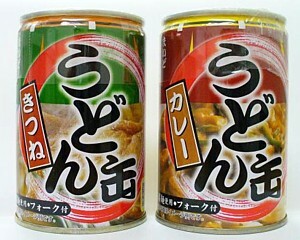 The kitsune udon is priced at around 300 yen ($2.60) per can, while the curry udon goes for about 350 yen ($3). Each ready-to-eat serving comes with a small plastic fork. The idea for UMAI's canned noodles came when the manager of the Men-ya Musashi ramen restaurant in Tokyo was distributing food and supplies to victims of the Niigata earthquake in 2004. There, he was inspired to develop noodles that could be enjoyed by people in areas with disrupted gas and water supplies. About 2 million cans of the popular ramen have sold since it was launched in April. To provide general consumers, disaster victims and Akihabara vending machine aficionados an ever-more enjoyable selection of canned treats, the company plans to keep expanding its product line. Future noodles in the works include kenchin udon, various regional styles of ramen, and canned versions of ramen from famous restaurants. next time I make an emergency pack (like you send with a child their first week of school to be stored for... emergencies), I'm going to Japan to do my stocking up.